It was misty on the big thumb that is Clearwater Florida this morning. We live on the inside curve of the Clearwater-St Petersburg peninsula. In the armpit, if you will, of “old Tampa Bay.” The bay is beautiful. Shades of watery blue beneath whitecaps and the shadows of Great Blue Heron wings. A clam pot for birds, a safe passage for kayak and paddleboard the Bay lacks the primordial punch of the great womb that is the Gulf of Mexico. We drove North and then West to the causeway at Dunedin. We passed through the gate and maneuvered into a parking lot for 100 with 98 spaces left. The thick fog of a bottom-heavy steel gray cloud was just rising as we kicked off our shoes on flour white sand. Bands of blue green water snaked through the opaque ashen waves as the rising sun topped the palms at the edge of the beach. If you want to have color, you have to have light. Without illumination, life is just shades of gray. Those that show up at the beach on a morning like this didn’t come with sunscreen and a People magazine. We come to the edge to restore and rejoice, or to soak up “beach time”, before the vacation runs out. Some stand ankle deep in salty water to reclaim dreams, or discover new journeys. Some come to petition the deities of great bodies of water for their divine assistance. Today I wasn’t clear who was doing what, except for one of us. I saw them coming. The two women walked slowly towards us wearing ultramarine blue t-shirts in different sizes. The older woman walked on the left. The deep lines of her face framed her expression of deep gratitude. Clearly this was an extraordinary day for her. She radiated joy; to be walking on this land between the waters, on this March day, with this young woman. The older woman held her worn-well Keds in her hand as they walked barefoot near the water. She leaned in, listening attentively to the words that flowed from her companion. Neither seemed to feel the sharp shell rubble or notice the few passersby. They were intent, focused. Indeed! They were pregnant with change. The younger woman was supremely pregnant, probably beyond pregnant and well into “overdue.” She walked strong, straight but with great care, balancing a belly that looked as if it might burst open at any moment. The young woman spoke fervently, passionately. Her words caught on the wind, tumbling across the top of the water. Her arm movements animated her story and the old women with the wrinkles smiled a quiet smile. We passed unseen. Standing in sunlight and blue water one moment, and chilly wind of storm clouds the next, it’s all here, and it’s all good. in the sand with my toe. We are all in this together. 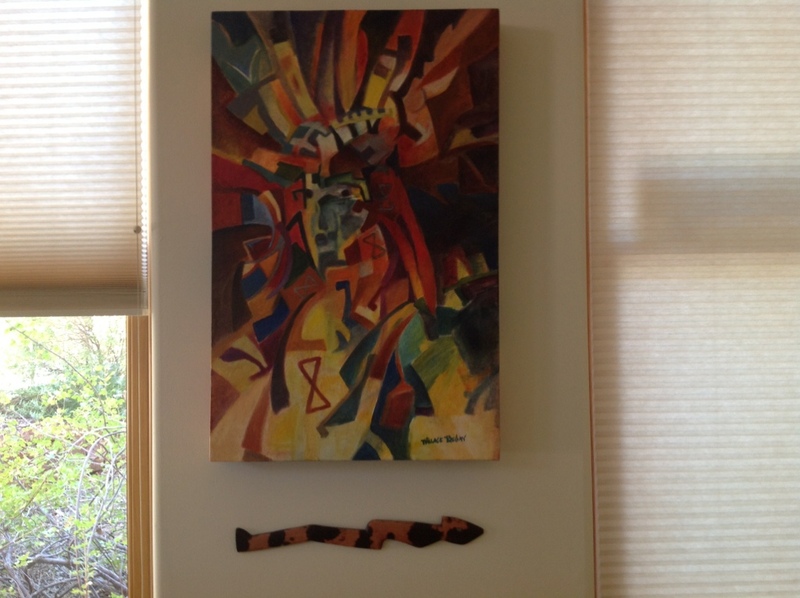 We bought this painting four years ago at the Indian Market in Santa Fe, just before I opened my first office. The painter is Wallace Begay, from the Navaho Nation. He told me that this is his image of this creation spirit in their pantheon. He comes in and out of manifestation as needed, was the way I understood him. I thought this Osiris counterpart would be a great resource for a therapy office where epiphanies move through like thunderstorms in August. Huge great thunderings and flowing tears, then the sun comes back out. Sometimes the shadow side just slips in and winks at us before it disappears again. I always hung him where I could see him, as a reminder of what is possible. He stood behind the client and they were mostly unaware of what and who they leaned into. Right now He is “all wrapped up” with a painting of mine from the 90s of an Adirondack rock face. This is what the client saw from their “comfy” chair. The rocks and trees are comfortable concrete landmarks of the physical world. Clients tell me there are caves to hide in, and cliffs to climb in that scene. Those two paintings; the manifest and the unmanifest, the tangible and intangible are both on their way to STORAGE this morning. Is my image of him perched on a six foot stack of boxes and furniture, legs crossed, smoking a pipe just an illusion? I believe It will all just wait. Waiting…. without impatience,without the desire to know When, or even How is a highly refined and respected attribute of some people we have known, particularly Native people. The alignment of human actions and intentions with the workings of the universe is an ancient practice that requires that the ego play second fiddle to the intuition and the love of the divine. Without preplanning or research our mini-exodus has all aligned on the most auspicious time. On Friday, when Sirius rises over the horizon in the early morning magic will manifest. The Nile will begin it’s annual flood, eagle bone whistles will be heard someplace up north and Two boys will be “adopted” by our family. Forever and always to be claimed as Matneys and Martells because their parents, Kelly and Luke, knew they were waiting for them, and they went in search of their children. No fairytale has had more peril and potential heartbreak than this Hero’s Journey. But this is a happy ending. Not only have wandering members of our ancient tribe been returned to us, they have brought their joyful beautiful sister Allison Eva with them. Courage has it’s own rewards. Intuition. Waiting. Alignment. Courage. Destiny. Divine intervention. =. Manifesting?